ELIGIBILITY OF JOB PROFILES AS USCE: CLASSIFICATION AND DESCRIPTION OF MOST RECURRING ROLES. To identify, categorize and expand on jobs that are commonly associated with USCE (United States Clinical Experience). USCE and related information was obtained from online resources. Google search was used to parse information using search terms related to USCE. A list of job profiles that have a recurring association with USCE was identified. These are listed below. They were categorized into divisions based on what defines a USCE per majority of residency program requirements. Three categories were evident and have been used in this article and have been depicted in the figure 1. This is considered as singularly the best avenue for US clinical experience. When most programs mean USCE, this is what they are looking for. For most FMGs who have graduated from a medical school it is exceptionally difficult obtain this. The reason being, externship by definition is an intensive, full time training for medical students (M1 –M4) in a field of their choice. Observer-ship to a university or university affiliated community hospital is the second best. This provides you with opportunity to obtain LORs from the faculty. Networking is the most efficient way to secure an observership. One resource is to get in touch with your seniors who have already matched. Ask them if they have seen observers at their institution. If not then does not mean you cant. Get contact information from them and you can even ask them to vouch for you. “The shotgun spam strategy. Obtain emails of the directors or senior faculty of multiple places all over the US. see this link on finding emails of faculty. Send emails to everyone on the list, requesting an opportunity to observer their clinical practice. Stress how important this opportunity will be for your future. Then follow this up with phone calls. This is more labor intensive but also has a higher yield. Target some senior high value faculty and arrange to have a meeting with them. Dont forget to forward a short resume to the them prior to the meeting. Be earnest about why you would specifically like to rotate through that institution and specifically with them (are they in psychiatry, neurology or nephrology? is it the absolute field of your interest). A registered nurse (RN) is a nurse who has graduated from a nursing program at a university or college and has passed a national licensing exam. There are plenty of information online regarding nursing schools. Most universities have nursing programs and the requirements may differ slightly from state to state. There are also some online universities that offer nursing courses, which can be taken in conjunction with, hands on classes. Respiratory therapists evaluate, treat and assist with diagnosis of respiratory/pulmonary diseases. In the United States, Registered Respiratory Therapists evaluate and treat patients with a great deal of autonomy under the direction of a pulmonologist. Physician assistants conduct physical exams, diagnose and treat illnesses, order and interpret tests, counsel on preventive health care, assist in surgery, and write prescriptions. Physician assistants work in hospitals, clinics, and other types of health facilities, and exercise autonomy in medical decision making as determined by their supervising physician. The professional requirements typically include at least two years of post-graduate education. They are educated in the medical model designed to complement physician training, rather than in the nursing model as nurse practitioners are. Physician assistants are not to be confused with medical assistants, who perform administrative and simple clinical tasks with limited postsecondary education, under the direct supervision of physicians and other health professionals. In the United States, the profession is represented by the AMERICAN ACADEMY OF PHYSICIAN ASSISTANTS. 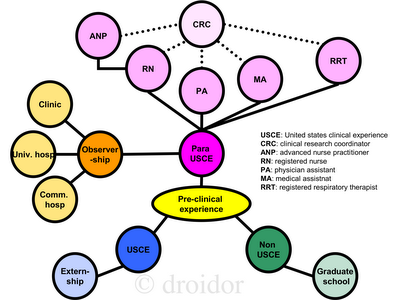 University hospital based para USCE training can be obtained only when you network with the hospitals themselves. Some programs offer such opportunities on their website. CCF.org, which is Cleveland clinic, offers such opportunities. One avenue for University hospital based USCE is to talk to office assistants in department of medicine/psychiatry/family medicine/neurology at Veterans Affairs Medical centers (www.VA.gov). You can find the nearest VA hospital near your location in the US and use that opportunity to call up the offices and see if they will allow for observership. Many private companies also offer ‘programs’ and ‘services’ to place IMGs in clinic-based practices with large sums of money. If you have $$$ to spend then this may be a better option as you are taking advatage of a set up network of agents, physicians and places. IF you don’t have the money to spend then you can network for yourself. This is where the power of Internet and phone comes to play and you can brute force your way into a USCE by talking to all the private practitioners in the area. The formula remains the same. Present your propositions, give some personal details, provide contact information and references and be very very polite. This is a credentialed post, meaning any one of the above can become a CRC. You could be an RN, and APN, PA-C, RRT and are eligible to be credentialed to be a CRC. In order for MBBS or FMGs to become CRC, you need to contact the institution and learn of their policies for such employment. Graduate students can thus in this way get into the clinica fields at the same time working in their research institution. Very helpful post. Thanks a lot. hi,i am planning to do an observorship in canada as i have a relative there who is a doctor in edmonton uni.will this be counted as usce??? etc, you get the point.